Digitize everything. For publication, you will need to have all your images in digital format; why not scan all you have? That will give you an easy way to view them in one format – and will put you along a path to creating a digital archive of your photo collection. Make sure to scan at a minimum of 300 dpi/ppi. Here’s a good guide. Create electronic folders for each ancestor or family group. If you have already started writing a family history and have a file structure for your writing, create a parallel file structure for your images and sort them accordingly. Creating a separate art log can also help you organize your images and thoughts. Illustrate as many people as you can. Try to have an illustration for most if not all key people in your ancestry. If your family history goes back a dozen or more generations, of course, that will be difficult. In that case, see item 10 in this list. Aim for balance throughout the book. Undoubtedly you will have many photos of one person and few of others. You needn’t include every photo of each person. Your goal is some kind of balance: say, two to four photos per chapter. But don’t be slavish about these guidelines. One person’s life might warrant more photos than another’s. Your log will help you keep track. Select photos from throughout a person’s life. Given the choice, for any significant person in your family history, you might opt to select a photo from babyhood or childhood, one from young adulthood (perhaps a wedding photo), and one from later in life. Select photos showing family groups. Photos of family groups have the advantage of showing many people at once – and also to show your relatives interacting with each other, particularly if the photos are candid or informal. Include informal photos. As implied in step 6, informal photos are more likely than studio portraits to bring your ancestor to life. They also show everyday clothing and everyday settings. Include images of homes. Not all your photos need to show people; don’t forget family homes or other places of significance. Bonus points if you have a photo of people in front of a home or business. I particularly love the photo (above) of my young mother-in-law with her father in front of her father’s real estate office, because it brings them – and also the place and the era – to life. Assess the overall image quality. Once you’ve done your preliminary selection, you might still have dozens of photos in front of you. Then I’d choose the best-quality image – with “quality” relating to the physical quality of the image, such as its sharpness, contrast, or composition, or to its character: that is, whether it shows personality. Supplement with photos or images from other sources as necessary. Sometimes you just have no photos of a person. In that case, look for something to illustrate his or her life: a photo of the church or school he or she attended; an image or map of a town where he or she lived; the person’s signature on a document; a birth, marriage, death, or other record – or a detail from a census. Here’s a list of some potential online sources. What if you have only one image of, say, your great-grandmother, and it’s a poor one, blurry or damaged in some way? Use it anyway! Even a poor-quality image gives us a sense of what the person looked like—and that’s more important than worrying about a tear or a blemish. And don’t overdo it on photo editing. Re-watching Ken Burns’ The Civil War series recently, I noticed that many of the images have spots and other blemishes. Somehow, those flaws give them character and lend a sense that, like their subjects, these photos have been through a lot. Have you been through this process recently? What hints would you pass along? The subject has also been covered here at Vita Brevis. Thank you, these are very good tips! Your comments are well taken. While I have not tried to write a family work, I have just completed my autobiography (including genealogical material), after being nagged to do so by my kids. The problem of what photographs to include was enormous. My wife was a photographer, we were married for 57 years, and we took many trips. The best I could do (with the help of my kids) was to include representative photos. Since I also included copies of documents, newspaper articles, family member writings, etc. (many of which would disappear if not included), the final tome ended up at over 500 pages! Sending copies to relatives and close friends resulted in delighted responses from recipients. I’m 97 years old, so I’m unlikely to start on a sequel. I am considering another small volume of just family photographs, with little or no narrative. Bravo, Hal! Am writing a large family history myself and deciding what to choose not just among the photos but all those documents you mentioned. You have given a great gift to your family. Congratulations to you for getting your life recorded for your family. That is quite an undertaking. I’m sure they will treasure it forever. What a great article! Very useful information, concisely presented! Thank you. I have written 1 section of my family history and gave it to my nieces, nephews and cousins for Christmas. I received many comments saying that they really liked the pictures. I imagine that some of them only skimmed the text. 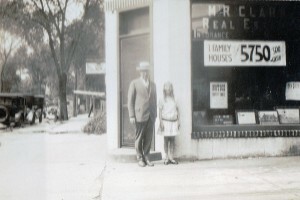 We also collect photos of both people and homes. While researching a Milwaukee family whose home WAS located where the convention center is now found was a disappointment. But, after going through the Milwaukee Historical Society files, we learned they also had files and photos organized by streets. Lo and behold there we found a photo of my husband’s great grandfather’s 1870s era business/residence that also included the family standing out front. New ever give up hope. Treasures are to found everywhere. For my mother’s memoir of her 1930s childhood, I took some photos of scenes in the local history museum of a school room from that era and added them to the book in black and white. That filled the gap where no family photos fit. Penny, an excellent overview. One additional area of photographs to include could be digital ones taken recently of antique furniture or family artifacts that are memorable. For instance, I have an antique doll that belonged to my great-grandmother as a girl, and also a doll’s trunk to go with it. Currently they are on my fireplace mantle, but I realized reading your article that including a photo of them in a family story would be one more way to bring this particular ancestor to life. I agree Judy and was going to add that point. I have two pieces of souvenir glassware from the Salt Palace with ancestors’ names engraved on them and my great grandmother’s calling cards in a little tin case. Handwritten letters are also a treasure worth documenting; they can tell so much about an ancestor’s personality and are rarely seen these days. Take photos or scans of these keepsakes and include them! Invest in a really good scanner. I’m still using my Epson V350 Photo scanner (full size) and I have the option of color correction, dust removal and a large dpi selection. I scanned a picture of my dad and 3 of his Navy 1945 basic training pals that was originally an almost brown 2×3′ print and was able to blow it up to 8×10, do color correction and scan at a ridiculous dpi (took 45 minutes to scan). I gave a copy to one of the men in the picture a couple of years ago and it was the only photo he had of that time in his life. His tears were my thanks. I would add to please NOT photoshop photos to make them “look better”. I have few photos of my family, and rely on relatives to share digital copies of what they have. I was so disappointed to find that he had “fixed” most of them to the point that they have little value as representations of the original person. He no longer had the originals, as they belonged to an older relative who’d passed away and the photos were distributed among a number of relatives. This breaks my heart, and his too, when he realized what his attempts to “clean up” the photos had actually done. I also want to say that while studio photos can be useful, I much prefer the photos that show people in their everyday lives. Many members of my family were delightfully funny and full of life, and the informal photos say more about who they are than any stiffly posed studio portrait could. One would want to use the formal photos for special events, certainly, but my favorites are still those that show, for instance, my grandfather standing with his fiddle, just having finished playing a set for a dance, his eyes twinkling. I never knew this grandfather, as he died when my father was in his teens, but that photograph brings him to life for me, and for my chidren and grandchildren.